Describe your experience with finding the perfect location for your PreWedding Session: We were fortunate to have a simple search process to find the perfect location for our session. We both met at UCSB during our sophomore year of college in 2010. So in our hearts we always knew that the PreWedding Session would be located in Santa Barbara. When we first met with Rene, it was one of the first things we talked about, we started brainstorming early on together. We chose specific locations that had a significant meaning to our relationship, while also fitting the Mediterranean/Spanish style of our wardrobe. What are your recommendations/tips for couples before/during their PreWedding Session? We underestimated the length of the session. Our biggest advice is to rest, rest, and REST the night before. Rene and his team had told us this, but you don't really know, until you know haha. Most importantly, trust Rene. Rene is an absolute professional who made us feel comfortable every step of the way. Make sure you have your outfit(s) ready to go. It’s best if you tie the outfit to the style of the location and of course, to your partner. I was originally going to wear white, until I remembered that Rene suggested a pop of color. I’m glad I took this piece of advice! Describe the moment he proposed: Our proposal speaks to who we are as a couple, adventure seekers. Chris picked Peru as his Bar Trip destination. As a quick aside, I had embarked on a 52-hike challenge (yes, folks, 52 hikes in one year) and Chris wanted to pick a destination that would have a breath-taking view, leading him to pick Peru and choosing Huayna Picchu as the spot where he would ask me to spend the rest of our lives together. Chris had a lock with the date engraved and a special note. The ring was hooped around the lock and Chris had the keys. Our trek to Huayna Picchu began. And it is worth saying that the trek was undoubtedly the most difficult climb any member of our group had experienced. Once the group made it, Chris knew it was time. He called me to take a picture. By this point, I somewhat knew something was happening, because Chris hates taking pictures. Still, I joined him and took pictures. Then it happened. Chris grappled me by my face and told me that he loved me. That he wanted to grow old with me. That he could not imagine traveling the world or raising a family with anybody else. And of course, I lost it. I could not stop shaking. Chris then got down on one knee and asked me if I would marry him. I said yes before he could finish. To this day, it is the most memorable day of our relationship! Interesting/fun facts about the couple or session : Chris and Karla met at a college social gathering at Goleta Beach on September 22, 2010. They will now get married on September 22, 2018, exactly 8 years from the day they first met. 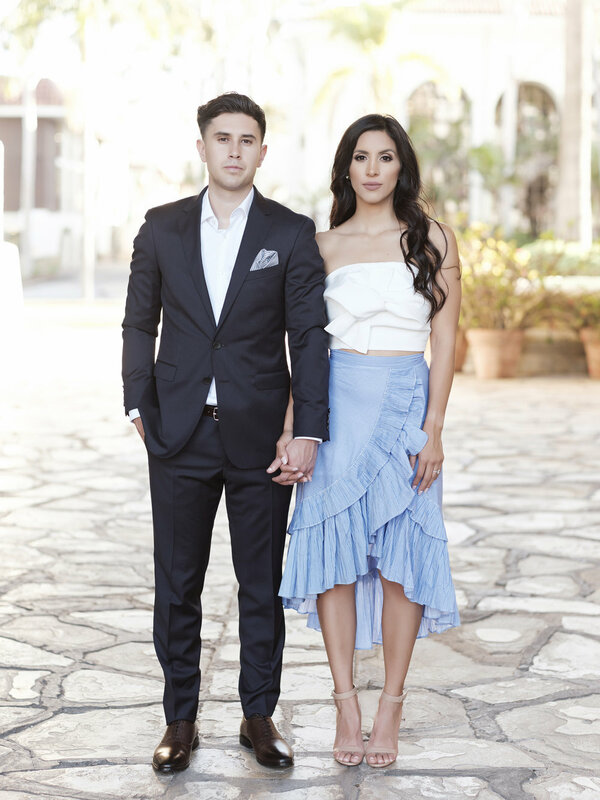 Chris and Karla chose the Four Seasons Santa Barbara as their venue because it is where Chris took Karla on a date for their 1st year anniversary as a couple. So as you can see, everything about their wedding holds a special place in their heart.